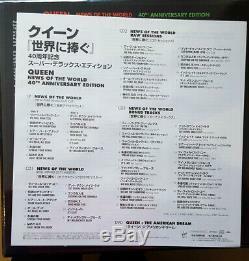 For sale is a rare sealed copy of the ultra high-quality Japanese version of Queen: News Of The World 40th Anniversary Edition. In addition to the all-analogue 180-gram vinyl, the three compact discs are produced with Japan's Super High Material audiophile technology. Experience the difference for yourself.. REMASTERED by Bob Ludwig and Sean Magee. PURE ANALOGUE LP cut of original album. THREE SUPER-HIGH-MATERIAL CDs (album, alternate takes, demos). DVD documentary "Queen: The American Dream". 60-PAGE BOOK of rare photos. It's front-loaded with two of Queen's. 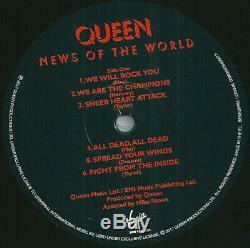 Biggest anthems -- the stomping, stadium-filling chant "We Will Rock You" and its triumphant companion, "We Are the Champions" -- which are quickly followed by the ferocious "Sheer Heart Attack, " a frenzied rocker that hits harder than anything on the album that shares its name (a remarkable achievement in itself). LP - "New Pure Analog Cut". 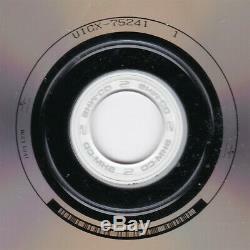 SHM CD1 - Original Album remastered by Bob Ludwig - 2011. SHM CD2 - Alternative, Demo and Live Takes. We Will Rock You (Alternative Version). We Are The Champions (Alternative Version). Sheer Heart Attack (Original Rough Mix). All Dead, All Dead (Original Rough Mix). Spead Your Wings (Alternative Take). Fight From The Inside (Demo Vocal Version). Get Down, Make Love (Early Take). Sleeping On The Sidewalk (Live In The USA 1977). Who Needs You (Acoustic Take). It's Late (Alternative Version). My Melancholy Blues (Original Rough Mix). SHM CD3 - Bonus Tracks. Feelings Feelings (Take 10, July 1977). We Will Rock You (BBC Session). We Will Rock You (Fast) (BBC Session). Spread Your Wings (BBC Session). It's Late (BBC Session). My Melancholy Blues (BBC Session). We Will Rock You (Backing Track). We Are The Champions (Backing Track). Fight From The Inside (Instrumental). Get Down, Make Love (Instrumental). It's Late (USA Radio Edit 1978). Sheer Heart Attack (Live In Paris 1979). We Will Rock You (Live In Tokyo 1982). My Melancholy Blues (Live In Houston 1977). Get Down, Make Love (Live In Montreal 1981). Spread Your Wings (Live In Europe 1979). We Will Rock You (Live At The MK Bowl 1982). We Are The Champions (Live At The MK Bowl 1982). Queen : The American Dream (Documentary). 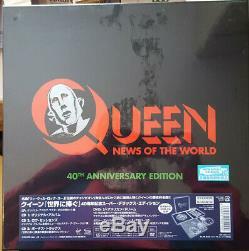 The item "Queen SEALED HQ JAPANESE EDITION! 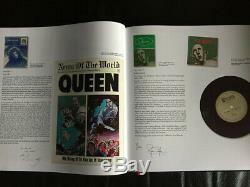 News Of The World 40th Anniversary" is in sale since Thursday, February 21, 2019. This item is in the category "Music\Records". The seller is "trinara" and is located in Ottawa, Ontario. This item can be shipped worldwide.